John and I got all gussied up and went out for a date last night....you forget how fun and important that stuff is even when you are married! We started off at rice.spice.noodle in Mystic, CT where we gobbled up pad thai, drunken noodles, and thai iced tea. 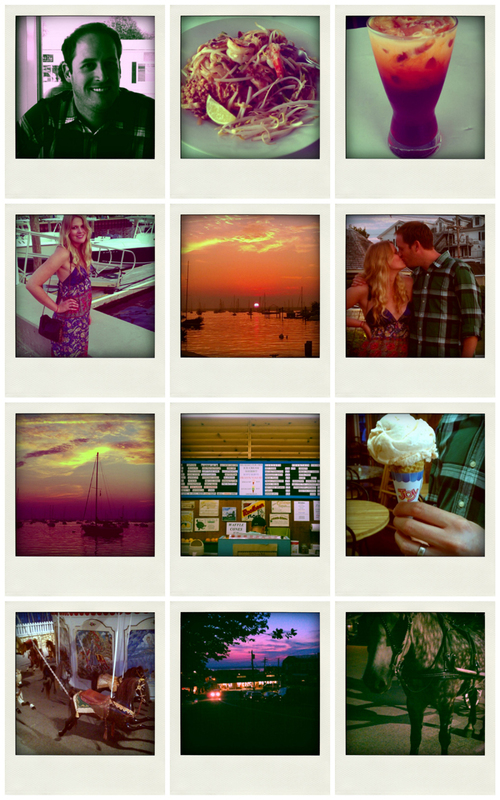 We then jammed over to Watch Hill, RI where we caught a stellar sunset and indulged in a little PG-rated smoochfest. We then moseyed on over to St. Clair Annex and split a fresh peach ice cream cone. It was amazeballs. I spyed the most gorgeous horse on the way over there....a spotted beauty that put its wooden carousel kin to shame. I love spending nights like that with my hubby. NOTE: We got some frightening news about Uncle Doug's health this morning...we would all be very grateful if you could say a little prayer for him. Each and everyone counts. cute date night photos. Looks like you had a great time! Oh my goshhhhh, I grew up spending summers in Watch Hill. The Flying Horses carousel was my fav! :) Sounds like a gorgeous date night. oh no lovely, i will definitely include Uncle Doug in my prayers and you guys too, many blessings all around!!! i hope things are okay! Doug and his family are in our hearts thoughts and prayers. I love this date night super cute! Aw, you and John are very cute altogether! !